Last Saturday, December 12th, the world stood still as photographers worldwide united in a photography movement called Help-Portrait, which gave more than 40,000 individuals portraits to treasure for a lifetime. On Saturday, more than 8300 photographers and volunteers participated in 715 locations in 42 countries. The idea was simple: giving photos not taking them. 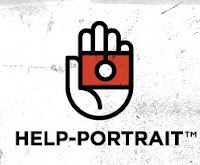 Help-Portrait was founded by celebrity photographer Jeremy Cowart with his vision of the photography community and individuals giving back this holiday season. "On December 12th, cultural borders were crossed on one side of the camera and competitive borders on the other," Cowart says. “I honestly don't know which side of the camera was blessed more. For many of our subjects across the world, Help-Portrait provided them with their first-ever family photo. However, we're consistently hearing from many photographers worldwide that this is the greatest thing they've ever done with their cameras." Help-Portrait stories have been featured on CNN, CNN.com, CNN International, CBS Evening News, HLN Headline News, The ONE Campaign, AOL Philanthropy Project, Sears/GNN.com, BritneySpears.com blog, New York Daily News, CTV News (Canadian), Egyptian Satellite Channel and more. Those photographed all had a story - all unique and heartbreaking in its own way. "Poverty steals a lot of things, like your home, car and food, but it also steals something on the inside. Help-Portrait feeds that something on the inside," states Help-Portrait Event Coordinator Annie Downs. Moved and inspired by the response from those who participated this weekend, the Help-Portrait team is thrilled to announce the 2010 date of December 4th. It is setting the precedent of future Help-Portrait events annually on the first Saturday of December. For more information on Help-Portrait: Visit the official site, follow the H-P team on Twitter @help_portrait (Hashtag #helpportrait), be a friend on Facebook http://www.facebook.com/helpportrait and watch the official YouTube videos . Videos from around the world can be found on the YouTube tagged page here. Photos from the events posted can be found here.